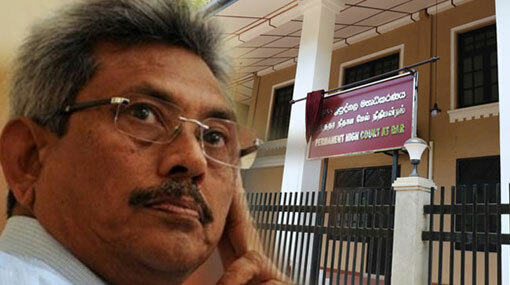 The objection filed by former Defense Secretary Gotabaya Rajapaksa challenging the jurisdiction of the Permanent High Court of Trial-at-Bar to hear the case over the D.A. Rajapaksa Museum has been rejected. This decision was issued when the case was taken up before the Special HC three-judge bench comprising Judges Sampath Abeykoon, Sampath Wijeratne, and Champa Janaki Rajaratne this morning (11). The former Defence Secretary had previously raised preliminary objections through his counsel that the Colombo Permanent High Court-at-Bar does not have jurisdiction to hear the D.A. Rajapaksa Museum case. In accordance with the Judicature (Amendment) Act, the Special HC is only authorized to hear cases pertaining to serious economic and financial crimes, and as this case does not fall into the aforementioned category, the Special HC does not have the jurisdiction to hear the D.A. Rajapaksa Museum case, the defence had argued. However, HC Judge Sampath Abeykoon announced today that the case is being taken up as per the orders of the Chief Justice, hence the Special HC cannot take a decision on its jurisdiction to hear the case. Accordingly, the Special HC rejected the preliminary objections raised by the defence. Upon the request of the defence, the judge bench ordered to issue a copy of the Chief Justice’s order to them. Furthermore, the attorney representing the 6th defendant of the case informed the court that his client, Dewage Mahinda Saliya, would not be able to attend today’s hearing, citing medical reasons. Further hearing of the case was postponed to February 22. The Attorney General had filed the case against the former Defence Secretary and six others for the alleged misappropriation of state funds amounting to Rs 49 million during the construction of the D.A. Rajapaksa Museum and Memorial in Medamulana. Former Chairman of Land Reclamation and Development Authority Prasad Harshana de Silva, former Director Board members of the authority Badrawathie Udulawathie Kamaladasa, Suddammika Keminda Attygalle, Saman Kumara Abraham Galapaththy, Dewage Mahinda Saliya and Srimathi Mallika Kumari Senadhira have been named as the other six defendants of the case.